Belize’s The Lodge at Chaa Creek has announced that it is offering travellers a free day and night’s stay throughout the month of August 2017 as a way to say “thank you” to guests and to allow new visitors more time to discover the surrounding rainforest and ancient Maya temples and cities. A complimentary stay at The Lodge at Chaa Creek makes an Autumn holiday in Belize more attractive than ever. 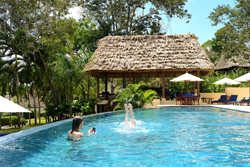 A late summer vacation in Belize offers excellent weather, a more uncrowded, laid back atmosphere and, during the month of August, a free night’s stay at The Lodge at Chaa Creek, the popular Belizean eco-resort’s reservations manager announced recently. Elsie Pacheco said visitors who book for a three night’s stay at Chaa Creek during August 2017 will receive a complimentary fourth night, along with selected daytime activities and complete access to a 400-acre private nature reserve containing seventy ancient Maya sites and miles of jungle trails maintained for nature walks and horseback riding. “We think a free night’s stay is a great way to wrap up a summer vacation, and with our policy that guests 17 years and under stay in their parents room for free, it makes a four day and night jungle holiday very attractive,” Ms Pacheco said. “It’s just another one of our ways to thank our many loyal guests while giving new visitors more time to get to know us,” she added. The Lodge at Chaa Creek was established as one of Belize’s first eco-resorts in 1981 and since then has become the country’s most visible and highly awarded advocate for sustainable tourism and responsible travel, receiving first place honours at National Geographic’s World Legacy Awards presented in Berlin this year. Chaa Creek offers a wide range of accommodations ranging from the more rustic Macal River Camp, the signature thatched-roof cottage collection, and suites and villas that include the new Ix Chel Luxury Villas offering private Jacuzzis, plunge pools and personal butler service. With amenities such as a fine dining restaurant featuring farm-to-table cuisine sourced from an onsite traditional Maya organic farm, an internationally recognised Hilltop Spa, a Belize Natural History museum, Blue Morpho butterfly farm, and activities ranging from canoeing, horseback riding, ancient Maya temple exploration, jungle safaris, guided nature walks and more, the resort has become known as Belize’s “Destination Within a Destination” Ms Pacheco said. Founding owners Mick and Lucy Fleming said they wanted to create a model of environmentally and socially responsible tourism that combines luxury with sustainable practices. “We wanted to show that you can provide luxury, quality and impeccable service while maintaining a strong commitment to protect the environment and benefit local communities,” Ms Fleming said. “And what we found over the years is that, more and more, today’s travellers respond positively to having their vacations benefit the land and people they visit,” she added. Ms Pacheco said she hoped that an extra day and night would allow guests to spend more time relaxing and exploring the rainforest, river, and rich bird and wildlife that surrounds Chaa Creek. “We know how important, especially in today’s busy world, vacations are to people, and we’re constantly looking for ways to help guests get the most out of their Chaa Creek holidays. Our vacation planners are organised in teams with different specialities, such as adventure, Maya culture, romance and family activities and use their expertise to help visitors plan out their stays. “For example, we’ll meet with families to discuss their favourite activities, and if, for example, one member is interested in horseback riding, another in canoeing the Macal River, another in nature photography or the many ancient Maya temples that surround us, we’ll make suggestions and help them plan their days and coordinate activities so that everyone is satisfied. “Likewise, our adventure romance specialists meet with couples to suggest things they can do together and organise couples massages, sunset canoe paddles or river excursions on the Miss Macal, romantic picnics in the shade of ancient Maya temples, evening champagne soaks in a private Jacuzzi, or any number of romantic activities,” she said. “A complementary extra day and evening that gives guests more time to relax is just one more example, and we hope the extra time will allow them to discover some of the natural wonders that make Belize so special, and that we are so committed to preserving, ” Ms Pacheco said.